MY CRAFTS and STUFFS: Featured Stamper Challenge - My FIRST! Hi everyone! It's my first time to join the Featured Stamper challenge over SCS and I found it so exciting! JulieHRR is our Featured Stamper of the week and you can view her wondeful gallery here. I chose to CASE her "You're my Cuppa" card and I just changed the dp, the ribbon and the image but maintained the lay out. 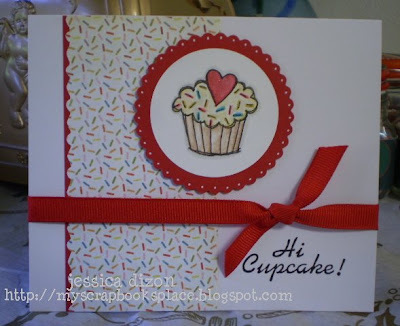 Gorgeous Card - Gotta Love Cupcakes. Hi I'm back to say congrats about making it on the Bizzy Becs design team. Sorry about the deleted comment, I said something about it. But then thought that you might not know yet and I would ruin the surprise. but I see you've got the logo in your sidebar now. Anyway, congratulations I look forward to seeing more of your great work. lol... it's too cute! Love the glimmery heart! A sweet card! Love it!